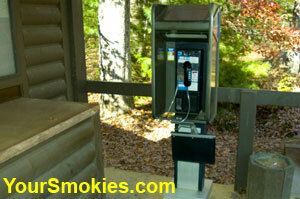 Accessible telephone at Cades Cove Station. In many cases the most accessible way to tour the Great Smoky Mountains National Park and see the wildlife, beautiful panoramic scenery and the historical buildings is by taking a tour by automobile or van. The 2 most popular paved roads that crisscross the park - Newfound Gap Road (441) running north and south connecting North Carolina and Tennessee and the Little River Road - Laurel Creek Road (73) which traverse the park east to west both offer stunning views, numerous pull offs and an every changing display of foliage and weather: sunrises, sunsets, fog, mysterious clouds, sunshine and snow. Available for purchase in the visitor centers is a 1 hour audio cassette tape you can play in your car as you drive Newfound Gap Road which will point out points of interest as well as interviews with people who used to reside in the park before it became a national park. The most popular "auto tour" area of the Park is the 11 mile Cades Cove Loop motor trail which sees millions of visitors a years. To me you can't say you have visited the Great Smoky Mountains National park if you haven't driven, biked or walked the Cove. Besides the well know and well travelled roads in the park, there are a few others which will let you get away from the traffic, roll down your windows and drive so slow you can touch a tree limb or watch a deer, squirrel or even bear from the safety and comfort of your car. There are also some outstanding tours you can do by car on unimproved (gravel) roads in the Great Smoky Mountains Park. These tours can take hours and are best done when there is plenty of daylight. Other than the Cosby - Big Creek - Cataloochee unimproved road which is open year round (weather permitting) these road close during the winter. The Smoky Mountains National Park has picnic sites and picnic pavilions throughout the park but only a few are designated as assessable. To make matters worse there is confusion with visitors to the national park as well as employees as to the fact that people without handicapped placards or license plates are forbidden from using these handicapped accessible designated picnic sites. Handicapped designates picnic sites are generally closer to restrooms and often accessible drinking fountains. All of these handicapped accessible picnic areas also have accessible bathrooms. Accessible campsite in Elkmont TN is near restrooms. The Great Smoky Mountains national park only has 3 frontcountry campgrounds with accessible camp sites that can be reserved in advance. Reservations for accessible camp sites in Cades Cove TN, Elkmont TN, and Smokemont NC can only be made if you are camping from May 15th to October 31st. Outside of these dates and for other frontcountry developed campgrounds in the Great Smoky Mountains National Park, accessible sites are first come first served. Reservations for accessible spots can be made by calling (800)365-2267. 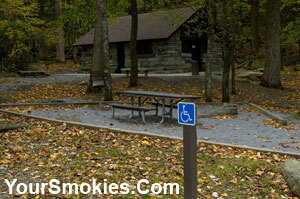 Accessible camp sites in the Great Smoky Mountains national park are located close to or next to restrooms which are also accessible. Accessible campsites are paved and level and are equipped with specialized picnic tables and fire grills. Be advised that for some reason, I have been advised by rangers who take reservations in the national park that you do not need any persons who are disabled in your group in order to stay in a handicapped accessible site. I personally find this practice deplorable and think that handicap accessible campsites should be handled the same way handicap accessible parking spaces are. If you are look to find the most accessible campgrounds in the Great Smoky Mountains national park, Cades Cove wins hands down. The Cades Cove campgrounds is more level than any of the other campgrounds, has accessible sites next to accessible rest rooms, there is an wheelchair accessible telephone (without amplification for hearing impaired) across from the Cades Cove ranger station, and the covered amphitheater is level with a paved path and adjacent to accessible restrooms. Don't forget, Cades Cove also has the best auto tour trail in the park. The only real "store" in any of the campgrounds of the national park is accessible and is located in Cades Cove right next to handicapped parking and across from the rangers station. The Big Creek campgrounds have accessible sites. 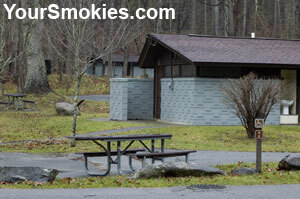 The Cataloochee Campgrounds have accessible restrooms but no campsite modifications. The Deep Creek NC campgrounds have an accessible campsite and restroom. The Elkmont TN campgrounds have an amphitheater with paved trails, but they are quite steep and persons in wheelchairs may require assistance. The Look Rock TN campgrounds do not have accessible restrooms but there is a paved fairly level trail to the amphitheater. The Smokemont TN campgrounds amphitheater has paved trails, but they are also steep and some visitors may require assistance. Further updated information about accessible camping on the Great Smoky Mountains national park can be obtained by calling (865)436-1230. The stables in the Great Smoky Mountains national park are equipped to handle high functioning disabled persons and the only stables with accessible restrooms are the Smokemont and McCarter's riding stables. A new addition to equestrian activities in the Great Smoky Mountains national park is wheelchair accessible carriage and hay rides in Cades Cove as the Cades Cove Riding Stables. Although Camping with your own horse in the Great Smoky Mountains National Park is popular with people who own horses, only one drive in Horse campsite, the Big Creek Horse Camp has any accessibility accommodations for persons who need them. Backcountry campsites that allow horses do not have any special accessibility accommodations what so ever. For more information about camping with your horse you should check out our Horse camping and trail riding in the Smoky Mountains National park page.